The Arbiter was hawt! Too bad his one song was so silly. I am so, so loving Euan Morton these days. He had to sing all of his songs with an accent, and did a superb job. He was terrific on "Franklin Shepard Inc." in SONDHEIM ON SONDHEIM. Some day I expect to see a revue comprised of all his nervous-breakdown-in-song numbers: "Mama's Turn," "Live, Love, Laugh," "Franklin Shepard, Inc.," etc. Not seen this play but I have to agree, the arbiter is indeed hawt in his way. Saw it in 1987 in London, with an amazing tilt-a-whirl stage and set. Awesome. If the stage keeps speeding up until the actors are thrown off, that would be awesome. There are finally limitations to the steepness of rakes on stage, except for those grandfathered in. I saw a really great production of it in the early 90's. They kept the production simple and that really let you concentrate on the music. Just when I thought I had run out of Deadly Gay sins, here's another. Thank-you mud. 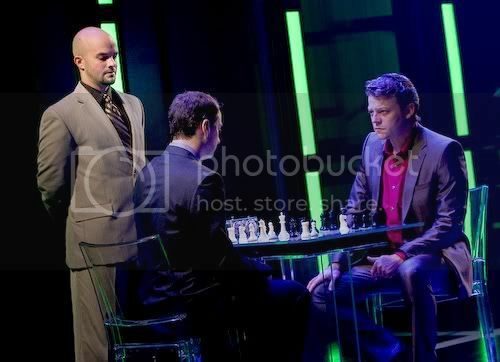 I had always thought that Chess was dead and gone after being so unsuccessful in its original run. I am very envious that you got to see it and that you enjoyed it. I have high school nostalgia for "One Night in Bangkok" and, perhaps pretentiously, always end up having it stuck in my head whenever I am in Bangkok (even when I am there for more than one night). "Chess" didn't do so bad. In London, it ran for three years and won the 1986 Critics' Circle Theatre Award for Best Musical. with rave reviews. Even on Broadway, it was doing "ok"... but not good enough. It got several Drama Desk and Tony nominations, but the eighties weren't a very successful decade for *any* musical. Let's hope for a comeback!